A quarry is a type of open-pit mine from which rock or minerals are extracted. Quarries are generally used for extracting building materials, such as dimension stone, construction aggregate, riprap, sand, and gravel. They are often collocated with concrete andasphalt plants due to the requirement for large amounts of aggregate in those materials. 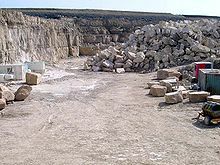 The word quarry can include underground quarrying for stone, such as Bath stone.